Granola...the hippy food that's become a yuppy treat bringing top prices for small bags of the good stuff. My answer? Make my own...a DIY...with the best ingredients. I love a little granola with my yogurt and fruit...my daughter likes hers with a scoop of yogurt, fruit and peanut butter with a little milk, like cereal...and of course straight from the bag in all it's crispy goodness is great, too. As I looked around the internet for a recipe that I could make with ingredients I had on hand, my taste buds were tempted by savory combinations but there always seemed to be something in the recipe that I didn't have on hand. And then I found Annalise and her blog Completely Delicious. She'd had the same problem I was having so she got creative...my kinda gal. 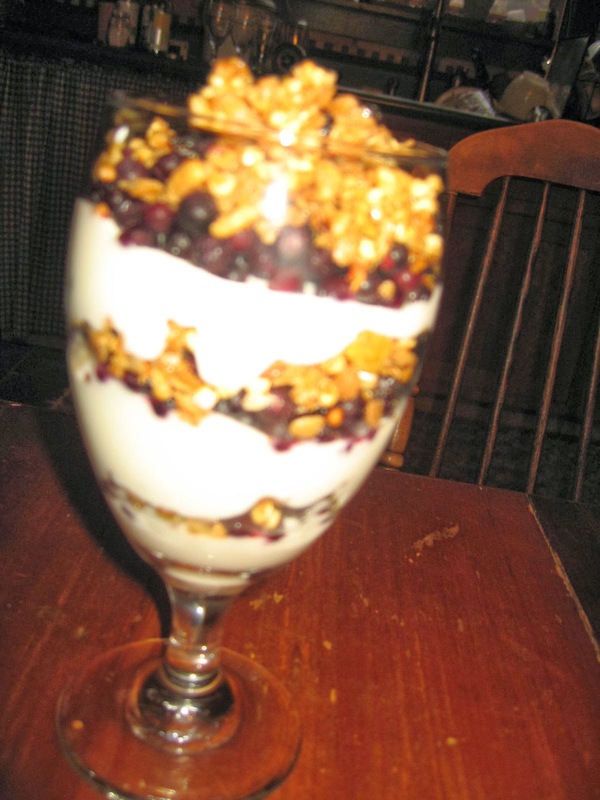 Her post How to Make Your Own Granola is perfect for me! I'm sure granola making isn't rocket science or anything nearly as complicated as baking bread but I wanted to start out with a blueprint...know what I mean? So go check out Annalise's post and make your own granola like I did. Then I followed the directions on Completely Delicious and it turned out, well, completely delicious based on the fact that my Goosie's fiance made a pretty good dent in the bag and we all snacked on it while I made chicken soup...my husband took a bag in his lunch and an extra one for his buddy...I sent a bag home with Goosie's beau (which he said would be his immune booster rather than the home remedy I offered) and made a parfait with frozen blueberries and yogurt for my lunch, leaving a few crumbs in the bag which Mr. Wood polished off this morning. I hate to admit this but I had made a double batch! Raid your pantry and make your own granola with whatever you find there. I couldn't help but notice that Annalise mentioned chocolate as one of the choices! Herb, Teas, Essential Oils, Tinctures, Incense and more! Start your own Herbal Medicine Chest Kit! Everybody does it but no one likes to talk about it...the BM...Mr. Wood says something about logging...am I doing it often enough?...too often?...what should it look like?...they sell products that mask the smell so no one knows you've done the deed...but in reality, Everybody...everybody poops! I've been looking at the Squatty Potty for a awhile now and when I saw that they had a few factory seconds available, I couldn't resist. I took the plunge...made the move...bought the stool... and now I'm asking you to check it out. The alignment of our body during this secretive time in our day makes all the difference in how effective the "movement" will be...and also how easy it will be on our bodies. Folks who often make this deposit without the help of modern plumbing fixtures are way ahead of the game because the posture necessary to perform this natural task in "au naturale" conditions puts everything in the right place and alignment, with no internal bends or kinks, to impede the evacuation required for a thorough elimination. Enter the Squatty Potty bringing you closer to a perfect posture for the healthiest elimination. It's official! The Woodwife's Journal is proud to be an affiliate for Squatty Potty alignment stools! Just click on the banner below to see what it's all about!